“Dear Ijeawele, or A Feminist Manifesto in Fifteen Suggestions” by Chimamanda Ngozi Adichie is a letter, a style of writing that doesn’t usually inspire much interest. After all, what could be said of import about feminism in the length of the average correspondence? However, Adichie masterfully uses her letter to a friend as an opportunity to write a modern accessible reflection on feminism. Encouraging and uplifting, “Dear Ijeawele, or A Feminist Manifesto in Fifteen Suggestions” is a book that succeeds in advancing the importance of achieving the equality of women through the use of engaging stories and a relaxed style. Adichie’s book is set up simply enough, with fifteen suggestions to her friend, Ijeawele, on how to raise her newborn daughter, Chizalum Adaora, as a feminist. Ranging from suggestions to ensure that the mother herself is a fulfilled person to giving her daughter a strong sense of her identity, Adichie covers an entire expanse of child-rearing ideas that are addressed specifically to her friend. For example, Adichie says “be deliberate about showing her the enduring beauty and resilience of Africans and black people.” While she does not limit herself to only discuss raising children, she interweaves stories about other women as a way to give specificity to her claims. “I know this remarkable Nigerian woman, Angela, a single mother who was raising her child in the United States; her child did not take to reading so she decided to pay her five cents per page. An expensive endeavor, she later joked, but a worthy investment,” she says. While this may seem disconnected, it is her way of showing her friend that she must teach her child to read, and perfectly reflects the fact that she makes sure her suggestions are easy for her friend to connect to in some way. The genius of Adichie’s book is perhaps the fact that anyone can connect to it. While it is written for someone very specific, she uses the resulting familiar tone of her writing to her advantage, as it enables a sense of kinship and understanding between reader and writer. “Your note made me cry. You know how I get foolishly emotional sometimes,” she says. This simple line at the beginning of a book on a serious subject is one key way in which she connects to her audience. More importantly, once she has made that connection, she is able to use her suggestions even more effectively, as her suggestions are not just for raising a child, but an analysis of the way in which women today live. “Beware the danger of what I call Feminism Lite,” she says. Adichie uses this warning to move her friend away from the philosophy of female equality under some but not all conditions, and yet it raises the question of how prominent “Feminism Lite” is in the modern world. However, Adichie’s book is by no means reprimanding people’s foibles. She criticizes evident injustices, but because her supposed audience is a friend, she keeps her tone light-hearted and friendly at all times. Perhaps the most inspiring aspect of “Dear Ijeawele” is that in Adichie’s in her capacity as a caring friend, she encourages the celebration of all kinds of beauty and identities. “Teach her to take pride in the history of Africans, and in the black diaspora,” she says. These perspectives may seem somewhat distinct from feminism, but as Adichie shows so masterfully, they in fact build it up. After all, how can a woman fight for her own equality when she feels shame about other aspects of her identity? One key way she does this is by rejecting the trope that feminists reject their femininity. “Feminism and femininity are not mutually exclusive. It is misogynistic to suggest that they are,” she says. And in celebrating the various ways in which women define themselves, she in no ways forgets men. “Surround Chizalum, too, with a village of uncles,” Adichie says. In her vision of a world where women are equal, all good men and women are celebrated, and she seeks to secure this future for young Chizalum. 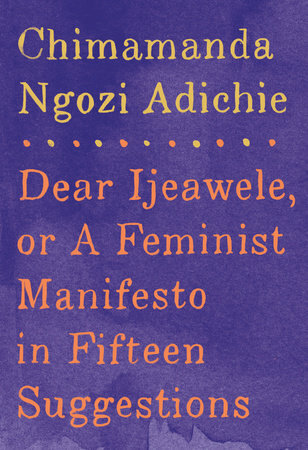 “Dear Ijeawele” is direct and strongly directed towards an important goal, but Adichie beautifully navigates her way towards finding a code for feminism that anyone can understand and relate to. While proponents of feminism may face many detractors, Adichie’s heartfelt letter to a friend reminds us that while the struggle for the equality of women may ruffle a few feathers, it is done with the hope that young girls will one day live in a world where they will see their own worth, intelligence, and beauty. “Dear Ijeawele” is just the beginning.